Welcome to No. 2 Templeview Downs, a bright and spacious 3 bedroom semi-detached family home set in a quiet cul-de-sac within this popular residential development. Presented to the market in walk in condition the property has been extremely well maintained by its current owners. Benefiting from a landscaped rear garden with large decking area, laminate flooring, PVC double glazed windows, gas fired central heating and burglar alarm system. Comprising of entrance hall which leads through double doors to a spacious lounge, to the rear there is an open plan kitchen / dining area & utility room. First floor comprises of 3 bedrooms with master bedroom en-suite and a family bathroom. 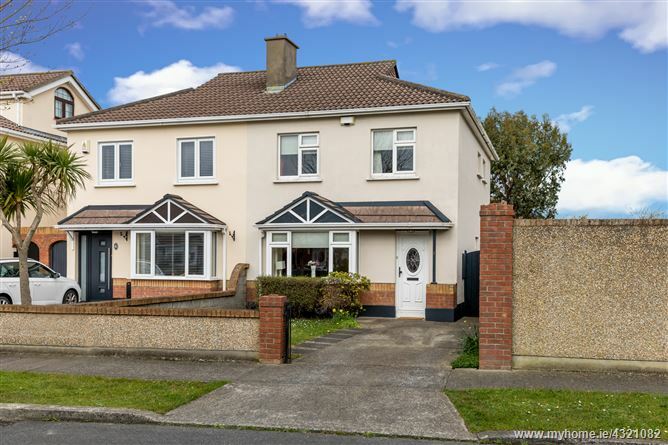 Ideally located the property is within walking distance of shops, Schools and commuter bus links to Dublin City centre while Clarehall shopping centre is also within close proximity. Viewing comes highly recommended. Lounge: 4.33m x 3.87m with feature marble fireplace complete with open fire. Laminate flooring. Bay window. Ceiling coving. TV Point. Kitchen/Dining area: 2.92m x 5.30m modern high gloss kitchen with range of fitted press units. Plumbed for dishwasher. Tiled floor and tiled behind work tops. French double doors to rear garden. Utility Room: .92m x 2.01m. Plumbed for washing machine & dryer. Landing: 1.84m x 3.62m with pull down ladder to attic (part floored for storage) Hot-press. Bedroom 1: 2.97m x 5.30m with built in wardrobes. Laminate flooring. En-suite: Comprising of power shower, w.h.b, w.c, heated towel rail. Recess lighting. Bedroom 2: 3.53m x 2.80m with built in wardrobes and laminate flooring. Bedroom 3: 3.52m x 2.40m with laminate flooring. Bathroom: 2.17m x 1.59m comprising of bath w.h.b, w.c. with varnished floor boards.